BALTIMORE - Miss Shirley’s Café is named for the late Shirley McDowell, who loved her job of creating and preparing fresh food, but it should be called Breakfast Indulgence. When you’re dutifully eating your oatmeal, what you’d really love is Miss Shirley’s pumpkin cheesecake-stuffed French toast with pumpkin cream cheese, whipped cream, and graham cracker, or her grilled breakfast kabob with turkey sausage, red bliss potato, applewood-smoked bacon, Granny Smith apple, Roma tomato, Cremini mushroom, and bell pepper with mango glaze. Miss Shirley’s is a creation of the Dopkin family, who employed McDowell for decades in their restaurant and catering business. The cafe was an immediate hit when it opened in 2003 and last year a second location was launched. While Miss Shirley’s is famed for its breakfasts, it has also garnered praise for its brunches and lunches. 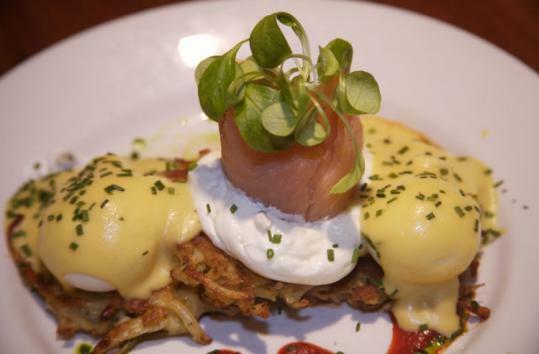 This is Maryland, after all, so your eggs Benedict might be enhanced with fried green tomatoes and crab and corn hash. A supposedly one-person serving of her Funky Monkey bread, iced, with chocolate sauce, nuts, and bananas could easily be shared by four; same thing with the French toast order stuffed with cream and mascarpone cheeses, flaked coconut and “bruleed’’ banana. Breakfast, brunch, or lunch, take your pick. Just don’t plan on eating again for a while. Miss Shirley’s Café, 513 West Cold Spring Lane, 410-889-5272, or 750 East Pratt St., 410-528-5373. www.missshirleys.com.